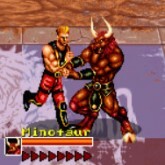 Description: Muntant Fighter is a classic arcade game created by Data east back in 1991. It really is not that great of a game, but I thought the beast fighting and levels were pretty neat. like a combination of a beat em up and a wrestling game. Love or hate it, give it a try lol.